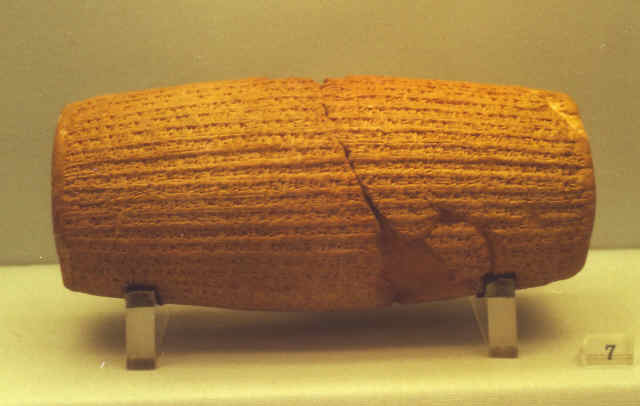 The famous Cyrus Cylinder was found in Babylon in 1879 and an additional fragment was found in 1970 and added to it. It is a barrel shaped clay cylinder written in Babylonian cuneiform, as a document to commemorate the restoration of the fortifications of Babylon by Cyrus. It is an account by Cyrus of Persia (549-530) of the conquest of Babylon in 539 BC and the capture of Nabonidus, the last king of Babylon, with the aid of Marduk, the god of Babylon, who had turned away from Nabonidus because of his impieties and injustices, and had appointed Cyrus to replace him. Upon the Babylonian's complaints, the lord of the gods became terribly angry and departed from their region, the other gods living among them also left their mansions. But Marduk who, because the sanctuaries of all their settlements were in ruins and the inhabitants of Sumer and Akkad had become like living dead, turned back his anger and had mercy on them. He scanned and looked through all the countries, searching for a righteous ruler willing to lead him (Marduk) in annual procession. He pronounced the name Cyrus, king of Anshan, declared him to be ruler of all the world. Without any battle, Marduk made him enter Babylon, sparing the city any calamity. He (Marduk) delivered Nabonidus, who did not worship Marduk, into Cyrus's hands. All inhabitants of Babylon, Sumer and Akkad, princes and governors, bowed to Cyrus and kissed his feet, jubilant that he had received the kingship and with shining faces. Happily they greeted him as master through whose help they had come to life from death and that all had been spared damage and disaster, and they worshipped his name. When I, well disposed, entered Babylon, I set up the seat of dominion in the royal palace amidst jubilation and rejoicing. Marduk the great god caused the big-hearted inhabitants of Babylon to .. me. I sought daily to worship him. My numerous troops moved about undisturbed in the midst of Babylon. I did not allow any to terrorise the land of (Sumer) and Akkad. I kept in view the needs of Babylon and all its sanctuaries to promote their wellbeing. and who says of Jerusalem, "It shall be rebuilt,"
and of the temple, "Your foundation shall be laid"
I returned to these sacred cities on the other side of the Tigris the sanctuaries which have been in ruins for a long time, the images which used to live in them, and established for them permanent sanctuaries. I also gathered all their former inhabitants and returned them to their habitations.